Well, the “Godzilla:All Art Attack” group show has been a success. The opening brought in a huge crowd, and the event was chronicled on several important websites. Taylor and Eric should be very proud. I am very happy that I am included in such a fun event. Of course, that has made coming up with something better for the next show, “Planet of the Apes: The Evolution”, a much harder task. I have the “bones” for several decent ideas. The problem is that I can’t, as yet, quite figure out how to properly assemble those bones into a decent painting. Just to give my mind a break, I thought I might work on something else for the moment. 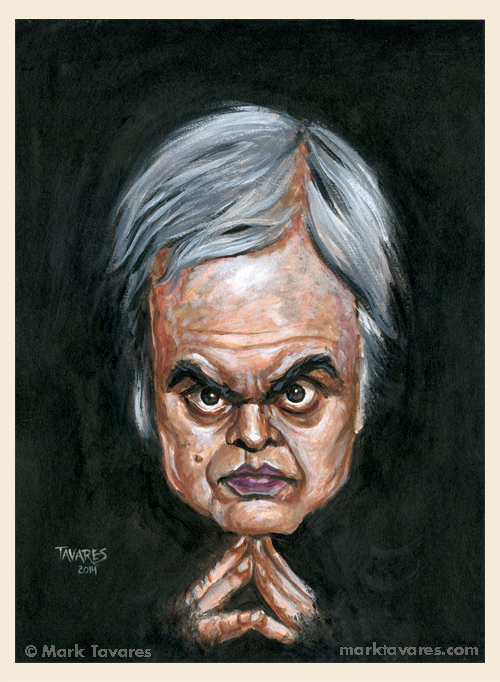 As you may have heard, noted Swiss Surrealist painter and sculptor, Hans Ruedi Giger, passed away last week at the age of 74. In case there is someone reading this who might NOT know, H.R. Giger is probably most famous for designing and helping to create the titular creature from the 1979 horror film “Alien”. Many considered his work to be genius. I am not sure about that. It was, however, intense, fascinating, and inspirational to generations of creature creators and nightmare designers. I had thought about doing a tribute piece that involved his most well-known creation, but there are plenty of those on the Internet already. Instead, I chose to do what I always do and focus on the man himself. Giger himself was as intense and surreal in appearance as anything he created with his airbrush. A most interesting character indeed. Hello all! I hope you had a wonderful Sunday honoring the Mothers in your life! In addition to being thankful for the Mothers in my life, I am also quite proud to announce that a new art show in which I have taken part opened this weekend. 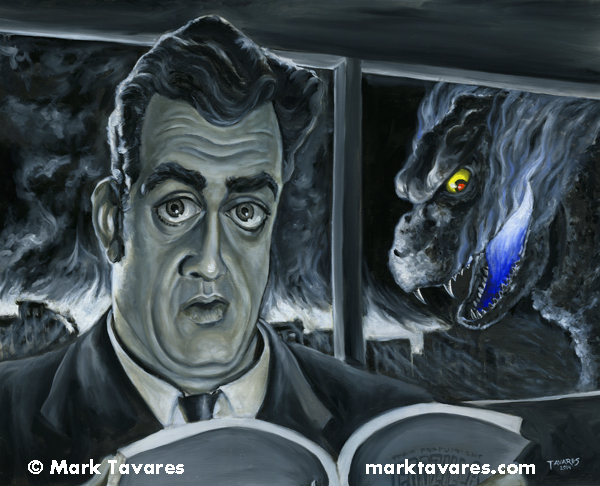 The “Godzilla All Art Attack art show opened to the public on Sunday. The show is being presented by “Creature Features” on Magnolia Blvd. in Burbank, CA, to commemorate the opening of the new “Godzilla” film this Friday, May 16. There is a huge display of artistic talent on display and I am honored to be a part of that crowd. Here is my piece entitled “Steve Martin’s Impending Regret”. The original is listed for sale in my “Current Work” portfolio. I have also made prints available through Fine Art America. Simply click on the “BUY PRINTS” link and it will take you right to the store. If you find yourself in the Burbank area during the month of May, do yourself a favor and check out the show! (BTW, it’s FREE!) Click HERE for info!